What I like: Sense of exploration, many of the puzzles. Not So Much: Uninspired combat, too much reliance on teleporters & pressure plates, undeveloped rogue class. While cleaning out my closet in preparation for the neighborhood garage sale, my foot clanked against something hard. As I removed my old clothes, my eyes caught my reflection and I jumped. My old set of plate mail. It has been a long time my old friend. My adventures under Waterdeep were long ago and my sword arm not as strong as it once was, but I wondered if I still had what it takes. As I rode through the Kingdom of Theraen on my way to Icefall Bay, my stomach rumbled as my supplies had run out. Obviously my skills for planning an adventure had atrophied along with my strength. Luckily, some magnificent deer grazed in the field next to the road. As I prepared my kill, I was unaware of the men who crept up from behind and knocked me senseless. When I awoke, the cold wind scratched unseen wounds across my face. I was chained to three others who I had never made the acquaintance of. Our charges were for poaching on the king’s land. The guards had no interest in my protests; after the charges were read we were informed our only salvation would be escape from Mount Grimrock and we were pushed over the edge. Legend of Grimrock is a first-person dungeon romp, in the spirit of Eye of the Beholder, Dungeon Master and other classics. I remember these games with a certain fondness, but did this style of game disappear for a reason? I also recall the original Dukes of Hazard, the A-Team and the Six Million Dollar Man as the pinnacle of prime-time adventure and high jinks. Could my memories of quality entertainment be a bit hazy when looked at through such passage of time? The premise is simple, work your way through the dungeon, combat creatures, and solve deadly puzzles to escape. The game play is pretty simple and covered well-enough in the 17 page manual and 4-screen static tutorial. Tooltips explain the character attributes and other in game items. 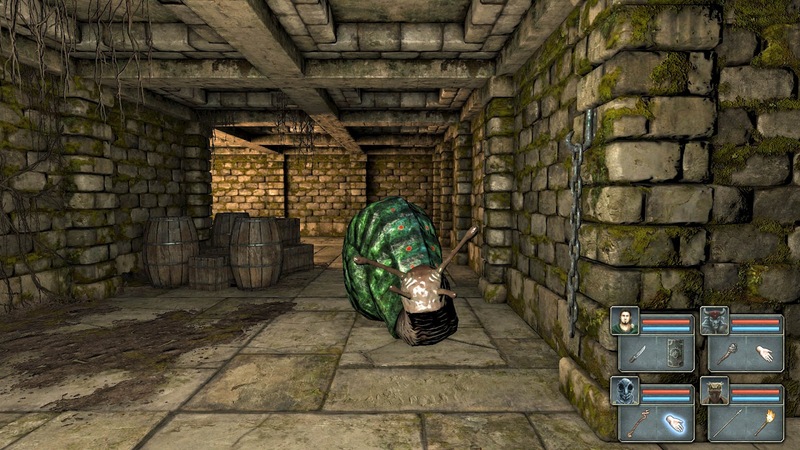 The game is all about making your way through the levels of the dungeon. These are not randomly generated levels in roguelikes, so the same puzzles and monsters are encountered on every play through. On the plus side, the creature placement is well balanced and puzzles more intricate. When setting up a new game, the player can choose from 3 levels of combat difficulty. I stuck with the normal setting. One option that old-timers may appreciate is the ability to disable the automap feature. If you do so, be prepared to get out your graph paper and sketch your own maps. Otherwise traversing the dungeons will be much more difficult. I for one had no interest in disabling the automap as it is the most important discovery since penicillin. I can’t imagine wanting to undo 20+ years of progress. Players anxious to get into the action can use premade characters, or those who want a little more control can create their own (like me). Once you are ready, you are treated to a bit of back story with some rather attractive static artwork. Then your adventure begins and your first objective is to locate some equipment, because the guards threw you into the pit without anything. Three character classes are available (fighter, mage and rogue) each sharing a set of 4 attributes and having its own set of 6 skills. Strength-affects your attack’s power and carrying capacity, dexterity-affects the accuracy of making attacks and ability to evade attacks, vitality-affects health and ability to overcome harmful cold and poison, and willpower-amount of energy for magic and special attacks. 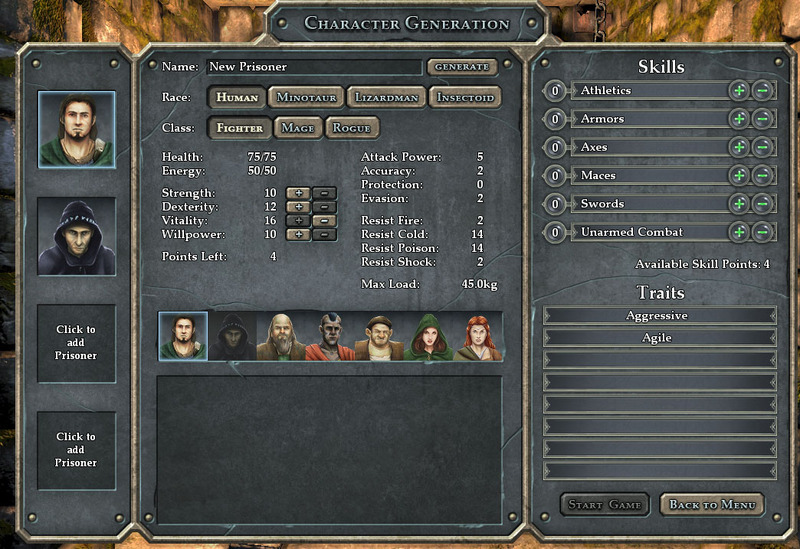 The player can allocate points to these skills upon character creation and each new level to tailor it to their liking. Unfortunately the rogue is really more of a ranged-based fighter rather than a class with unique thieving abilities. The mage’s role is essentially to bring some ranged firepower to the party. The spells aren’t particularly interesting. To be honest, I didn’t explore every spell, but the ones I did basically just caused some elemental-based damage. There is slightly more variety than that, but I don’t think much more. As skills are improved, different perks are gained (i.e. – more effective use of shields, greater strength, new attack, etc…). None of these really made the game more interesting, but just provided a way to improve the abilities of your character to meet the greater challenges as you progress through the dungeon. Two traits can also be granted to improve some aspect of your character (i.e.-more health, evasive, etc…). As you can see from the screenshot below, 4 races are available. Humans can excel at any class, while minotaurs are geared to fighters, lizardmen to rogues, and insectoids as mages. Your party is arranged into a 2 x 2 marching order. The front row is able to use melee attacks (and is susceptible to them), while the back row is limited to ranged attacks (unless they have a special skill). In general the back row is safe from melee attacks, but can be hit by some magic and elemental based-attacks. Creatures attacking from the side or rear can also hit the back row. Exploration is the most enjoyable part of the game, along with solving puzzles. Movement is handled via the WASD keys, or using the optional on-screen arrow button interface. I opted for the WASD keys. Your party moves one grid square at a time, turning 90 degrees per turn. A mouselook option is available using the right mouse button, but I never really found the need for it. There are sometimes interactive elements, such as chains, levers, or small buttons. Secret rooms and passages can be discovered, which frequently have some goodies to aid in your escape from the dungeon. Bits of the story are revealed now and then, but don’t expect something along the lines of a Bioware adventure. There is enough to add some context to your predicament. Combat is handled in real time. Party members’ attacks are initiated by right clicking on the weapon. There is a cooldown period for each attack, so you can’t spam attacks without limit. Special attacks, such as a bash, are unlocked as weapon skills are increased. The user has no control over when they occur and they essentially just give a damage boost during random attacks. Heavily armored fighters are better at absorbing damage, while evasive characters may be able to dodge and avoid the damage entirely. Unfortunately this combat mechanic isn’t really explained, so one really never knows which is better other than through observation. My agile fighter seemed to live longer than his heavily armored counterpart. Spell casters are handled a little differently. Spells can be learned by finding scrolls with the required rune pattern illustrated (top image in above screenshot) or through trial and error. To cast a spell, the player must initiate the attack by right clicking on the spell caster’s staff. 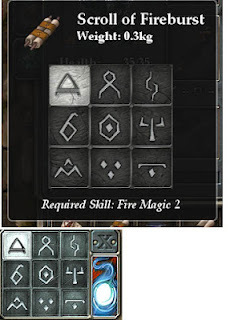 This opens the rune interface (bottom image in above screenshot). The user must click the runes for the desired spell, and then press the cast button. This must be repeated each time the spell is cast. Some players have complained this is too cumbersome in the heat of battle. Since I typically cast the same one or two spells, this wasn’t too big a deal. I think a happy medium would have been to retain the last spell, so the player only had to jump through hoops when changing their spell. There are 19 spells in the game, but the player will typically only learn 4-8 of them. Different potion recipes can also be found on your travels and can be created if you have the reagents. Characters must be fed, but I never ran short of food. I suppose if you rest a lot your food supply may dwindle, but I usually made use of other methods of healing. For me, combat was a pretty big letdown. There are not a lot of choices to make during combat. The biggest key to success is the player’s ability to manually move their party out of harm’s way. Then move in to spam your attacks as fast as the cooldown allows, sip an occasional potion, and run away if necessary. It felt more like a simple arcade game than a role-playing dungeon romp. I fought all creatures in essentially the same manner. There were a couple that stood out as more interesting, but I will let you discover them rather than mention them here. Puzzles are primarily of the pressure plate, teleporter, and lever flipping variety. There are some more, but these are the most common ones. They are generally well done and solvable. I did resort to some online help 3-4 times, but in general I felt like I should have figured it out on my own. My trouble usually stemmed from ignoring something I shouldn’t have. There is one very frustrating sequence towards the end that forces the player to click repeatedly in several different places to find the right spot. I have to admit I hated that puzzle. I think the biggest missed opportunity in Legend of Grimrock (other than having interesting combat), is that the secret buttons on the walls were nearly identical. More creative use of buttons and other interactive elements would have made exploration a little more engaging. It is a fine line between making it interesting and too frustrating, so I understand the developers’ caution, but it could have been better. I did only find 55 out of 71 secrets, so perhaps I missed some more interesting ones, but I doubt it. Minor spoiler coming up, but it may save you a lot of wasted time-> I never encountered any illusionary walls, so I don’t think there is a need to bump into every single wall to see if you can move through it. The Steam version offers 40 achievements to obtain. I obtained 25 of them during my play through without trying. Other than that there are not any multiplayer / online features. My favorite visual aspect of the game was the static artwork displayed during the introduction. They captured the mood perfectly and were quite attractive. The dungeon graphics themselves were fine, along with the creatures, but nothing extraordinary. 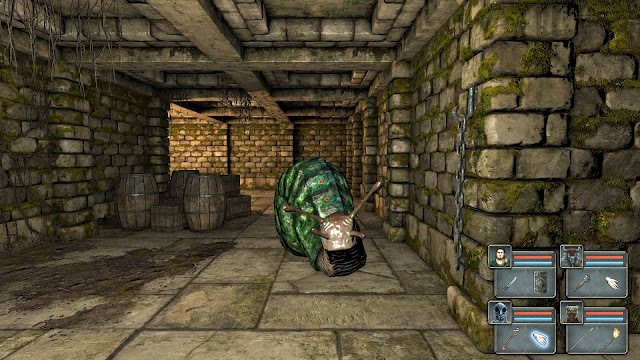 They did get pretty repetitive, but perhaps that is expected in a dungeon crawler. More effort could have been done to have greater visual variety. The only music is played in the menu screens and during character creation. There wasn’t a lot of variety to it, but was enjoyable. I’m a sucker for stringed instruments. In game sounds were pretty limited, but useful. Some monsters made more noise than others, so you can hear their approach. Press some buttons and you can hear something opening in the distance. These auditory clues are much more useful than an elaborate musical score during play. I have to admit I bought into the fervor on the Legend of Grimrock forums and was pretty excited for the game’s release. While a decent game, it isn’t the urn full of awesomeness I had hoped. The sense of exploration is there. Whenever I found another button I wondered what secrets would be revealed. Most of the puzzles were enjoyable, but a lesser reliance on pressure plates, teleporters, and the like would have been welcome. Some did require the player have a sense of timing, which can be a good or a bad thing depending on your outlook. Combat is mostly an exercise in strafing and dodging, instead of making meaningful tactical choices. To be honest I wouldn’t miss the combat if they removed it completely. Instead, I hope they figure out how to make it more interesting to take their next game to a higher level. Despite the many shortcomings, I did have a pretty good time playing it. For those who don’t think they would enjoy these styles of puzzles, I would downgrade the score significantly as the combat doesn’t really add much value. It has been a long time since I played Eye of the Beholder or anything similar, so perhaps those older games had the same weaknesses. I’m tempted to see if I could get it to run on my system. Were those older dungeon romps the classics I remember them as, or are they just another Dukes of Hazzard? I did have a bit more fun than apparent by just looking at an explanation of the features. Amazing game. I would give like 8/10. 8 sounds about right. 6.5 is too low. The game deserves better. I respect both of your opinions and am not questioning your right to disagree with me. I would just like to remind everyone that a 6.5 is not a 65%. My letter equivalent was a B-. A B in school is about an 85%, so a B- is about an 82%. On a 1 to 10 scale, a 6.5 is a good (not but great game). A 5 would be an average game. I just wanted to make sure you didn't think I was giving a lower score than I really am. Sorry if there was some confusion. I think I may do away with the number grades and stick with the letter and text grades, such as B (good). Since many game review sites don't properly use the 1-10 scale (everything pretty much gets a 7-10), it causes confusion on sites that do try to properly use the scale. Nice review. I think I'll put it on my steam wishlist and buy it on a borng weekend. Will you agree that this game made graphic whores out of oldschool dungeon crawlers ? The actual game has literally nothing over dozens freeware projects in the gameplay department, and the only reason that anyone cares at all - is shiny graphics. Would you still play this if monsters were 5-frame sprites ? What if it had free textures with no normal mapping ? Would you care about puzzles or combat even then ? Good question. I'm not familiar with the freeware projects you mention, so I can't compare. After playing Legend of Grimrock, I tried to play the original Dungeon Master. While the graphics were bad, it was the lack of automap that did me in. I just don't have the patience to draw my own maps anymore. I could live with the clunky graphics. I feel that graphics can take a good game and make it better, but they can't take a poor game and make it good. I'm not as crazy about Grimrock as many other sites are. Rock, Paper, Shotgun gave it a rave review. I don't think it deserved that, but it is that authors opinion after all. If Grimrock focused more on the combat and didn't have as many puzzles I would have given it a much lower score. Someone Please Make This RPG! !